Central Election Commission will spend 39 136 784 GEL on 2018 Presidential Elections. 28 272 634 GEL of it will be spent on polling procedures. 1 002 300 GEL is allocated for the capacity building of the election administration members; 2 424 850 GEL will be spent on the TV-advertisements of election subjects and 7 619 000 GEL will be spent on funding of election subjects. The President of Georgia shall be elected on the basis of universal, equal, and direct suffrage, by secret ballot, for a term of five years. Regular elections for the President of Georgia shall be conducted in October of the calendar year in which the President’s term expires. The President of Georgia shall, by the Prime Minister’s countersignature, fix the date of elections not later than 60 days before the election. Any citizen of Georgia having the right to vote, who has attained the age of 35 may be elected as President of Georgia. The same person may be elected as the President of Georgia for only two consecutive terms. Candidate is elected as the President of Georgia if she/he gains at least more than half of voters. The Presidential Elections of 2018 is scheduled in October. At this stage, only opposition political party Girchi has nominated its candidate – leader of the political party Zurab Japaridze, who will participate in the 2018 Presidential Elections. Japaridze said if he is elected, he will double the budget of the state defense for the next 5 years, will annul compulsory military service and will pardon the people, who were convicted for drug-related crimes. At the same time, he will veto all laws, which “restricts freedom” and will present the reports of the ministers to the society via Facebook Live once a month. Member of the European Georgia Giga Bokeria said that if the second round of the presidential elections is scheduled, his political party will support any pro-western candidate regardless the political atmosphere. Bokeria spoke about the upcoming presidential elections in his interview with the Week’s Interview of the GPB. As for the possibility to expect second round in the presidential elections, Bokeria mentioned the example of 2017 municipal elections. Acting President Giorgi Margvelashvili will ran out his term in November, 2018. 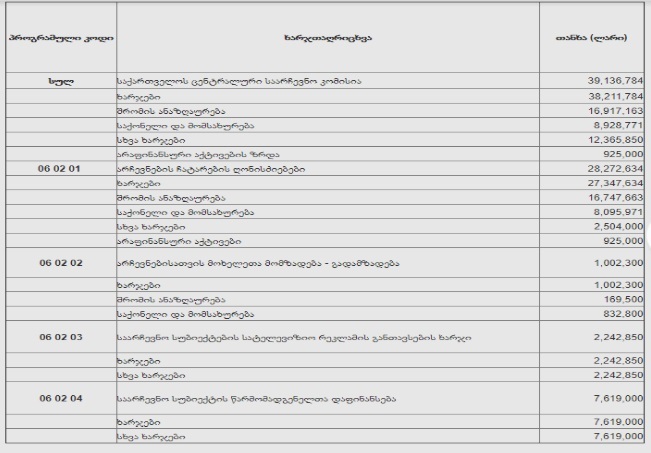 Giga Bokeria believes if Margvelashvili decides to participate in the elections, he will not reach the second round but the European Georgia will support him anyway. On June 29, UNM announced a new initiative, according to which, if their candidate is elected, the political party will reimburse the loss of the population, who suffered from bank loans during Georgian Dream’s governance. In addition to that, they will announce 2 year moratorium on the payment of loans to the banks and micro-financial organizations. In the frame of the project, the political party offers cooperation to the citizens, who have particular economic and legal problems. Georgian Young Lawyers’ Association reacted to the pre-election promise of the UNM. “We believe that in the above mentioned act, presumably is revealed the breach of requirements of the Organic Law of Georgia on ,,Political Unions of Citizens’’ in respect of carrying out prohibited activities by the party, its representatives and vote buying. In particular, according to the Organic Law of Georgia on “Political Unions of Citizens,” the attempt to interest the citizen of Georgia in pecuniary funds, securities, tangible or intangible values or by providing or promising the service (including fictitious labor or any other relations) is prohibited for the party regardless who carries it out, whether it is the party, its candidate, representative or any other individual. Conceivably, vote buying comes to pass, which is exposed by interesting voters in the promises of transferring pecuniary funds that is neither related to the future distribution of budgetary funds nor implementation of the future state policy as described by the law on Political Unions of Citizens as well as the Criminal Code,” the statement of GYLA reads. According to the GYLA, it should also be taken into account that the political party initiated the program mentioned several months prior the presidential elections, whereas the victory of the presidential candidate of the party does not necessarily mean that the party comes to power. GYLA calls on: the State Audit Office to examine the above mentioned fact and response appropriately within the frame of competency; and political parties and their representatives to respect the Georgian legislation and ensure to meet the requirements that are prescribed by the acting legislation. In accordance to the Organic Law of Georgia on the Elections, in order to nominate a candidate for President of Georgia, a party and an initiative group of voters shall file an application to the CEC Chairperson no later than the 50th day before the polling day. After the filing of an application, the party and the initiative group of voters shall have the right to collect signatures of supporting voters.